If there is one thing that no one wants to deal with, it is a clogged toilet. Unfortunately, as you are well aware, this happens all the time. In most cases, you can get rid of the problem fairly easily armed with just a plunger. Of course, to get the job done right, you are going to need the best toilet plunger available on the market. Like most people, though, you probably have not given a great deal of thought to what the ultimate plunger may look like or even what features it has. The good news, though, is that you don’t really have to bother about this since we decided to handle the nitty-gritty for you. There is nothing attractive about having a toilet plunger in your bathroom. With this OXO plunger, though, this particular issue is taken care of. See, it is equipped with a hideaway canister that quickly and easily conceals the plunger, making it a classy fit for any bathroom. This feature also ensures that the plunger portion of the product doesn’t come into contact with any other household item as well. Of course, this isn’t the main feature of the plunger. There is also the fact that it works incredibly well and is suitable for a wide variety of toilets, even low flush ones. The plunger is durable, allowing it to be used for a longer period of time. You will also find that it is low-maintenance as the plunger has a ridge-free design, ensuring that it stays clean during most tasks. The handle on the plunger makes it quite easy to use as well. It offers up a secure and comfortable grip, making it simple for virtually anyone to use. The only minor inconvenience with this plunger is that it can be rather large and so isn’t a good size for smaller bathrooms. The Master Plunger is certainly not what you would imagine when you think of a toilet plunger. Nevertheless, this design that allows it to do what many other plungers can’t. The patented bellows are the real star of the show here, ensuring that enough pressure is created to unclog virtually any toilet, sink, or other plumbing outlets that you can think of. This means that you should be able to handle most clogs by yourself without calling in a plumber. One of the things that you will notice about this plunger is that it is rather short and compact. There is a reason behind this, however. It is this size that makes it so versatile. You can use it in sinks, bathtubs, and similar areas as you will be able to get a good grip from any level. It is this low profile, though, that can also be a bit of an issue if you aren’t careful. You will need to watch the way that you are handling the plunger or you may discover that there is splash back. Finally, despite what it may look like, you will see that this plunger is actually quite durable and be used for a long time. 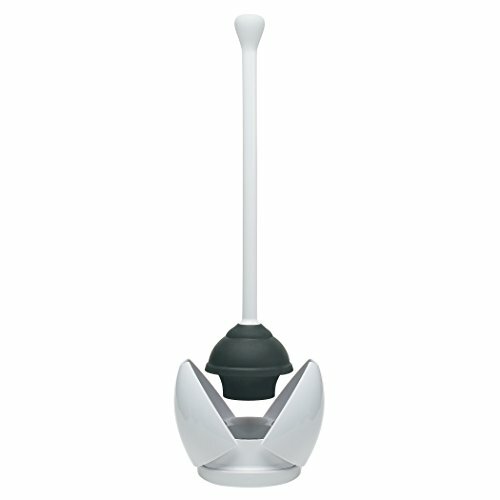 If you are looking for a next-generation toilet plunger, then you will definitely find it with this Samshow product. That’s because this plunger tackles clogs in a whole new manner. See, not all clogs can be dislodged with a simple use of pressure – sometimes you need something more effective. This is where the Samshow plunger comes in. It is a siphon-type with a bendable plunger head. Such a design allows the plunger to reach further into the drain and break up any clogs. While doing so, it also manages to clean out other debris as well. Although this may sound a bit complicated, it is actually incredibly easy to use this plunger. With a simple push-and-pull action, your clog will disappear in no time at all. Not to mention, the long handle adds to the user-friendly design while also keeping you far away from the splash zone. 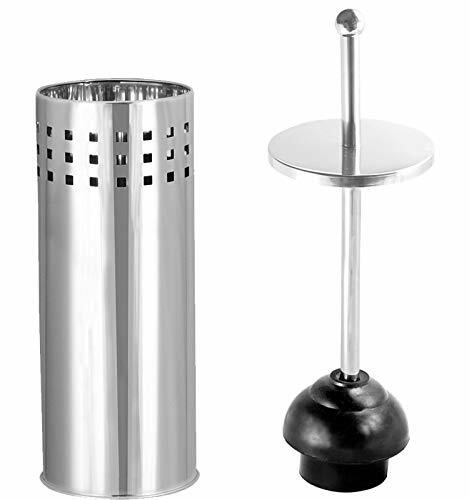 The plunger also consists of only high-quality material like stainless steel and ABS plastic. This lends durability to the plunger, ensuring that it will not break easily. The only real issue with this plunger is that all of the bristle-like features can be a bit unhygienic as they have a tendency to collect dirt. One of the things that really stands out about this plunger is that it has a multi-use design. As such, you will find that you will be able to use it for most plumbing clogs. The plunger head ensures that you will be able to use this product to dislodge clogs in all kinds of toilets, including low flush ones. To add to this, you can also utilize it for bathtubs and similar plumbing outlets as well. Thanks to this, it is actually quite versatile. There is the fact that this plunger works quite well too. The industrial rubber head is able to form a tough seal, ensuring that just the right kind of pressure is created. This makes dealing with most clogs an absolute breeze. Now, one of the disadvantages of the plunger is that the handle is quite short. On the one hand, it does make this plunger compact enough for any bathroom. The downside of the size, though, is that you are in the splash zone whenever you use the plunger. What is certainly an advantage, though, is the aesthetic appeal of the plunger. Not only does it come with a canister, but the design is also suitable for most bathrooms. Best of all, you can’t even tell that you are keeping a plunger in your bathroom either. 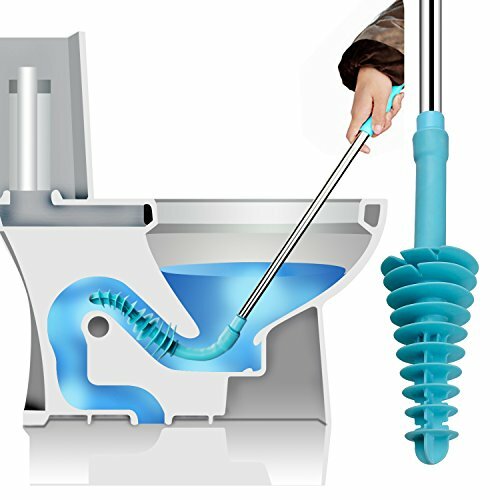 Are you tired of traditional toilet plungers not getting the job done? If so, you should check out this automatic plunger instead. Unlike other plungers, this one relies on CO2 cylinder being shot out by the plunger to get rid of the clog. The cylinder can be replaced, ensuring as many uses as you want. As you can imagine, this generates a great deal more force and pressure than traditional means. Therefore, it requires virtually no effort at all to get rid of even the most stubborn clogs. 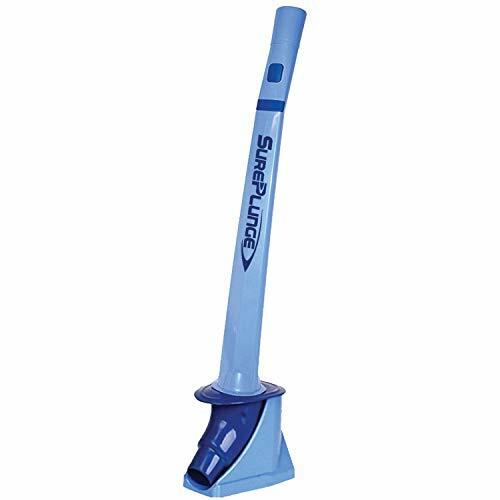 The entire process may take a little getting used to but once you have the hang of it, you will find that it is incredibly easy to work this plunger. In fact, with this toilet plunger on hand, you will probably find yourself calling the plumber a lot less than before. Another great aspect about this plunger is that it works on all kinds of toilets – both old and new. So, regardless of your setup at home, this plunger is sure to get you the results you want. Of course, the minor inconvenience with this plunger is that you have to keep topping up on those CO2 cylinders that have to be bought separately. This can mean that you have to wait for the replacements as well as invest further money in the plunger as well. In this section, we will take a look at everything that you need to know in order to select the perfect toilet plunger for your home. Standard/Cup Plunger: this is what most people imagine when thinking of plungers. The cup-like head of the plunger creates a vacuum-like seal, causing clogs to dislodge with the force. Now, despite its popularity, these plungers are actually better suited to flat surfaces like sinks and bathroom drains. So, these may have limited usefulness when used on toilets. Flange Plunger: in reality, it is the Flange plunger that can really claim to be a proper toilet plunger. While it does bear similarities to the original version, it is the bit of rubber that curves outward that really sets it apart. This flap makes it easier to position this plunger over toilets and create an appropriate seal. Therefore, this can often be a better tool for you. Accordion Plunger: as the name suggests, the accordion plunger has a head that has ribbed features. This, too, is perfectly suited for toilets due to its narrow design. Since it is able to fit in toilets well, it is suitable for breaking up even the toughest clogs. At the same time, some people do find that it is kind of difficult to use if you don’t have much experience in working plungers. As you can imagine, the most important feature of the plunger is the rubber head. This article has highlighted all of the different products that are out there which goes to show that they can come in all shapes and sizes. So, when selecting which design is right for you, it can be a bit tricky. For the most part, look for a plunger head that can create a quick seal over the toilet. This will ensure that you are able to create a good vacuum and get the right pressure to break up the clog. A good toilet plunger should be able to do this with relatively little effort on your part. Most people don’t pay too much attention to the plunger handle when selecting this item but it is important, nevertheless. To start with, look for one that has a good grip. After all, when trying to create a vacuum, you need to be able to hold onto the handle tightly and comfortably. Then, it is a matter of looking at the plunger handle. Typically, longer handles are a better option. This way, when you do use the plunger, you are less likely to get splashed during the unclogging process. There are some clogs that require a little bit of additional strength and effort. So, if your plunger isn’t able to take this added pressure, it may snap when you need it most. To prevent this from happening, look for one that has a handle and plunger head that is made from durable materials. This way, you can be certain that it can withstand most of what you throw at it. Smooth Surface: with smooth surfaces, dirt is less like to stick to the plunger head. Therefore, it makes it a lot easier to keep this type of plungers clean. So, if you are looking for something that is low-maintenance, this is a feature you should keep an eye out for. Canister Housing: if you don’t want to display your plunger as is, consider one that comes with built-in or equipped housing. This way, when the plunger is not in use, you can hide it in plain sight. To wrap things up, when searching for a toilet plunger look for one with optimal design, handle length, and durability. If you are looking for something versatile that can be used in a myriad of locations, either the Blue Donuts or Master Plunger options will be a good choice. If you want a plunger that is slightly more heavy-duty, the OXO plunger will do the job well. Finally, for more creative plunger options, the SurePlunge and Samshow designs will work perfectly for you. So, now you can effectively choose a plunger that will be a suitable fit for you and your home.